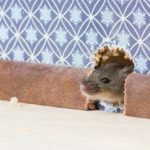 Home / Modern Pest Blog / Do Mice Have Bones? Do mice have bones? Believe it or not, we at Modern Pest Services, are frequently confronted with this question. In short, yes – mammals, such as mice and all rodents, have bones and a full skeletal system. So the real question becomes, how do rodents, like mice and rats, get into my home? How small of a hole can mice fit into? While rodents may seem to have Houdini like abilities, mice and rats are actually designed to squeeze into very tight spaces. They also intuitively understand that if they can fit their tiny heads into a hole, the rest of the body can follow. And no wonder, considering underneath all that fur, rodents have long narrow bodies, strong legs, and no collar bones. A rule of thumb that we have around here, at Modern Pest Services is, any hole the size of a nickel is big enough for a rat to squeeze through. While holes the size of a dime, can accommodate a mouse. That makes for some pretty tight quarters, and often homeowners underestimate those little cracks and crevices around their home as too insignificant. Once a rodent decides to move into your cozy abode, to ride out the winter, they can use their strong jaws and incisors (which continue to grow their whole life) to quickly make that tiny dime-sized hole a bit larger, for a more convenient entry point. Related: What Makes Mice More Than A Nuisance? 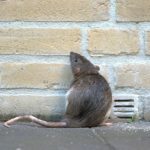 Therefore, it is no wonder why pest control professionals stress the importance of sealing up the smallest of holes and crevices to keep rodents out. Hiring a pest control professional can give you peace of mind, as they are trained to look for these type of openings, as well as other conducive conditions in or around your home that would entice and attract rodents to consider moving in. Every season brings a new threat from pests – like rodents. Be prepared. Modern Pest Services offers a HomeCare Green program for year-round pest protection, including rodents – guaranteed! Contact Modern Pest today for a FREE quote. 1-888-997-3312.